- It is a quick process. 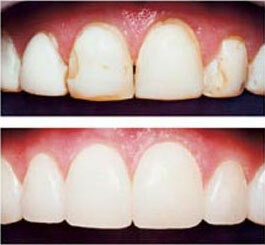 - It does not reduce the tooth’s original structure and is relatively inexpensive. Composite filling materials come in many different shades so we can match the natural color of your teeth. Composite bonding, however, is not as durable and long-lasting as veneers and crowns and may need to be replaced or adjusted as time progresses. They tend to stain easily and therefore requires proper cleaning. In order to ensure the longest possible duration of the bonding, these restorations should be brushed and flossed daily. Common staining elements include coffee, tea, red wine and tobacco.